Maddie turned 8 on June 7th, but celebrated her special day just last weekend! She got sick several days prior to her scheduled party in June and had confirmed Influenza A – possibly Swine Flu – so the party was postponed, but she enjoyed it all the more – plus she got to be the birthday girl for an extra month! Maddie had a great day with her friends and family at the park. 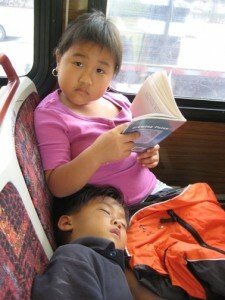 The kids played and played til they could play no more… and slept extremely well that night! This birthday was not just another birthday for Maddie… it was an EXTRA SPECIAL celebration of Maddie completing her treatment and getting the chance to be a healthy, normal kid again. We celebrate Maddie’s life not only on this day but EVERY day…. Kapiolani Hospital just finished producing their100 years centennial aniversary commercial and the Komatsu family was so fortunate to be a part of it. The commercial will air starting Monday June 15th, here is a sneak peek! It’s been a long road… but SHE DID IT! Maddie took her last chemo meds by mouth on March 25th and endured her last spinal tap and bone marrow biopsy on March 27th! Her spinal fluid and bone marrow was clean and cancer free!!!!!! It’s been 26 months since Maddie was diagnosed with Acute Lymphoblastic Leukemia, and she fought it like a champ. Yes, there were many bumps on her journey, and challenges along the way – both emotional and physical – but she stuck it out and trudged along, knowing she had to stay strong to fight this terrible disease that had invaded her little body. Maddie has hundreds of beads to remind her just how many times she’s struggled with merely the thought of her next treatment or poke. And although she wants to completely erase it from her memory, she will one day realize that these past two years of her life is something she should never forget. Remembering her battle will help her recognize and comprehend the strength that lies within her… it will keep her humble and always remind her how fragile life is – but most importantly, it will remind her how necessary and critical it is to give back to those who have helped save her life, and for her to live life to it’s fullest – for there are great plans for her. Maddie is already learning to give back. During Girl Scout cookie sales, Maddie collected donations for her personal mission, “Operation: Smile”. 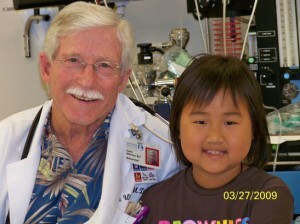 Monies donated to Operation Smile are used to buy cookies for kids and their families both inpatient and outpatient at Kapiolani Hospital and the Pediatric Ambulatory Unit (PAU) where kids like Maddie are treated for cancer and blood disorders. This year, Maddie recruited her Brownie sisters (who happily agreed) to help her deliver the cookies. The girls went room by room to explain the different types of cookies they could choose from, and they got to see how happy it made the kids and their families… mission accomplished! Thank you to all who donated generously to Relay for Life, to help fund finding a cure for cancer. With your help, Maddie raised over $2000 for the American Cancer Society for this event! This will become an annual event that we will participate in. Later this year, we will make our own team for the first time. Wanna join us? 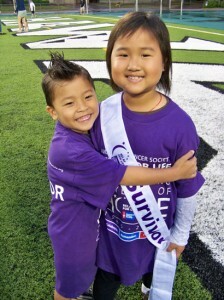 Relay for Life honors those who are battling cancer and those who have lost their lives to the disease. It’s an emotional 12 hour overnight stay that represents the first 12 hours of a cancer victim’s life as they start treatment – the cold and the darkness they face early on. It’s a touching event that everyone should experience at least once. Stay tuned for more info on the Magic Island Relay for Life late summer(?). Scott and I want to thank you – many dear friends we’ve known for years and new friends discovered during our journey – for walking alongside of Maddie and our family down this long, dark and gloomy tunnel. At the darkest and dreariest part, you were right beside us, holding our hands and encouraging us to keep going – sometimes even carrying us. Through your compassion and graciousness, you gave us comfort. Through your prayers and encouragement, you gave us hope. You were always there when we needed you, and we are absolutely blessed to have each and every one of you in our life. We will continue to post updates on this blog to let you know how Maddie is coming along… and Trevor too! We’ll post fun stuff this time! Since treatment ended a couple of weeks ago, Maddie and Trevor have both learned to ride their bikes without training wheels and started swimming daily again! Maddie is FULL of energy and is craving life more than ever! 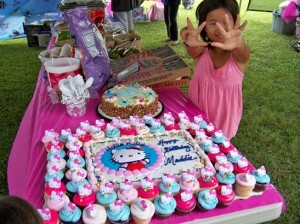 When we asked Maddie how she wanted to celebrate this HUMUNGOUS occassion, she said Legoland and Disneyland of course! Maddie is now on “steady treatment” which means she will continue to take blood tests once a month along with a broad spectrum antibiotic given through her port. Her next blood test will be at the end of April. I have to say that I am a little nervous about it since it will be her first blood test since treatment ended. After 6 months, her port may be removed and the antibiotic will stop. After the next 6 months, blood tests will be done every other month, and spread out further for the next 5 years when tests will then be done annually for the rest of her life. The risk of relapse in the first year after treatment is completed is about 2%, and continues to drop every subsequent year. Maddie will be considered an official survivor after 5 years of remission, so prayers to keep her body cancer free is still needed! Dr. Bob said to go and live as normal a life as possible now. He said to treat Maddie like a regular kid. Play sports, be around sick people… but coming to the hospital every week WAS normal for us. That’s all we can remember. It became so routine for Maddie too. She knew what day of the week she’d have to catch the bus with Nana to meet me in town for her appointments (she will definitely miss riding The Bus so often!) We scheduled our lives around Maddie’s weekly ANC. Dr. Bob said there’s life outside this hospital, and he’s right. It’s just a little disquieting to transition back to a relatively “normal” life and trust that she’ll be ok. But we have to be as ecstatic about starting a “new life” as Maddie is – and boy… is she ever! WATCH OUT WORLD…. HERE SHE COMES! Madison entered the Fusion 2009 talent contest for the 3rd straight year. This is a talent show where Nazarene schools around the island compete against each other in art, music, dance, etc. This year Maddie did a wonderful job singing, “Part of Your World” from the Little Mermaid. She ended up winning the solo category for 2nd and 3rd graders. I put a short video of her performance below. ENJOY!!! On January 15th Madison was on the morning news promoting the 2009 Girl Scout Cookie sale. Yes, its that time of year again and if you want to get your order in please let us know before Friday January 30th. You can contact me at scott.komatsu@gmail.com or maddie, madison.komatsu@gmail.com thank you for all of your love and support! Help Colt Brennan fight Leukemia! Our good friend Kyle at the Willows Restaurant has once again opened the doors of his establishment to help raise money for a great cause. Below are the details to the event, you can contact me scott.komatsu@gmail.com if you would like more information or if you would like to join us at the event. Thank you Kyle, The Willows….and of course UH and Colt Brennan! On February 3rd, 2009 Colt Brennan will be making his first public appearence of the new year at the Willows Restaurant for “An Evening with Colt Brennan”,a fundraiser to benefit the Leukemia & Lymphoma Society. • Approximately every 5 minutes, someone is diagnosed with a blood cancer. True to his word about wanting to come back to the islands and help the people of Hawaii, Colt will be on hand from 6 till 8:30 pm to help fund cancer research and hopefully put an end to Leukemia forever! More and more details about the event are being planned but we hope to have more of the current UH Warrior seniors there for autographs, the UH Cheerleaders and / or Rainbow Dancers, Coach Mac, and we are VERY close to getting a committment from Davone Bess to also attend! In addition, the evening will feature HEAVY pupus by the Willows Restaurant, HOSTED BEVERAGES from some AWESOME people at Keoki Brewing Company, Kai Vodka, Southern Wine & Spirits and Paradise Beverages. ALSO, Pride of Hawaii Sports will be setting up “The Greatest Colt Brennan Memorabilia Store EVER!” Helmets, jerseys, photos, you name it! Autographed by not just Colt, but stuff from Davone, RGM, Jason Rivers, and also a handful of our Warrior Seniors too like Ryan Mouton! For more information and to keep updated, please go to http://coltforleukemia.willowshawaii.com/ or feel free to post any questions here or call me at (808) 952-9200 to purhcase tickets. Your best bet when calling is to ask for me (Kyle) or Chantel Oh, Monday through Friday. As a small bonus and to celebrate the Warriors Hawaii Bowl appearence, I’m offering a pair of sideline, blue section tickets to the first person from this message board who calls me to purchase 4 or more tickets to the event. Songs of Love is an awesome nonprofit foundation that personalizes original music for children and teens with chronic or life-threatening illness, free of charge. We submitted a request for Maddie on October 1st during her last stint in the hospital and 4.5 weeks later it arrived in our mailbox. Maddie danced and sang along with a HUGE smile on her face. I wanted to take this time to thank Songs of Love and help them spread the word about their amazing foundation and how much these songs means to the children and their familes. Maddie’s doing awesome! Treatment began again two weeks ago at about 60% of her regular dose. She will gradually be raised back up to her regular dosage. Her ANC this week was 3100 so her dose was raised to 80%. Dr. Bob said that although her ANC looks good, if she was put back on her full dose, her ANC would likely crash again. She got her flu shot in her leg yesterday and was surprisingly pretty good about it. The nurses forgot to call to let us know that she’d be getting one that day so it was unexpected for all of us. And you know Maddie… she has to know exactly what the plan is — and doesn’t expect anything different. But she was a big girl about it and even asked me to stay out of the room. Knowing how Maddie is with shots anywhere other than her port, three nurses went in the room with her while I listened outside. She had some anxiety for a couple of minutes than it was over! Today, her Girl Scout troop did a service project to raise money for an organization close to our hearts… the Hawaii Children’s Cancer Foundation. The girls participated in a Keiki Swap Meet at Koolau Shopping Center where they sold their toys and other items. They will be donating 100% of their proceeds to the Foundation. Unfortunately, it rained non-stop from last night — and is still raining while I write this — but the girls braved the weather to accomplish their goal. When Koolau Shopping Center heard what they were doing, they jumped in and said they would match their proceeds! Kudos to Koolau Shopping Center! Maddie’s Girl Scout troop will be delivering over $1000 to HCCF which means a lot to Maddie and her Brownie sister Addie, who is also a Leukemia survivor. This is a great way to teach the girls to give back as much as they can, not only to their community, but especially to those who have helped us. HCCF is a foundation that offers all kinds support – both financial and emotional – to families of children with cancer. It’s organizations like these that really came to our rescue in our times of need. We are so blessed by them. Enjoy your families and have a great weekend! Maddie’s ANC went from 56 last week to 5078 yesterday… amazing!!! Her body had just had enough chemo and demanded a break… slowly but surely the neutrophils all decided to surrender and come out of her bone marrow all at once! She was able to get her scheduled spinal tap and will continue treatment from here. Her chemo is reduced to half dose until her body gets re-acclimated. We don’t want to have to deal with low counts again next week. Maddie prayed and prayed that her counts would be high enough to “do fun stuff” during her last week of Fall break. And she was so ecstatic that it has! She is excited to go out and do all the things she’s been wishing she could do these past few weeks – but really, just leaving the house for somewhere other than the hospital is a HUGE thing for her. I think the chemo is affecting her a little more since her body had such a long break. She’s been complaining of some nausea since her treatment yesterday but is still gung-ho for outings. She went back to swimming for 2 hours yesterday afternoon as soon as she found out her counts were high but came home so very pooped. She’ll realize she has to start out easy. We braved the Food & New Products Expo today. I remember how much fun it was – before we had the kids. Bad idea. I haven’t been for a few years but now it’s all smashed into the Exhibition hall and SUPER crowded you can’t even stop to say hello to a friend or you’ll get trampled. And Trevor’s so small he could hardly see above anyone’s waistlines the whole time. It was more stressful than fun. We’ll cross that outing off our list for a few years and spend our energy on more kid-friendly adventures. For those of you who are lucky enough to have Fall Break off – enjoy it and know that we, who don’t, envy you! We went in for Maddie’s scheduled spinal tap and chemo today. We found out that her counts are going down instead of up. When we left the hospital on Wednesday, her ANC was 102. We thought that since she hasn’t had any chemo for two weeks now, her counts were definitely on it’s way up. Her ANC was only 56 today. That means that of the blood sample they took, there were 2800 white blood cells but only 56 were neutrophils (the good stuff that fights infections). That’s 2 percent. That’s the same percentage that it was earlier last week. Her ANC needs to be a minimum of – or close to – 500 to continue treatment. Her spinal tap has been rescheduled to next Friday. Please pray that her ANC will be 500+ so we can get on with treatment. It’s an uneasy feeling for both the doctors and us to hold off from any chemo for so long. Next week will make three weeks without any! More importantly, that fevers will be kept at bay until her count comes up. It seems her body was just yearning for a break and is taking awhile (a long while) to produce the good stuff we’re waiting for. We have to cheer for her neutrophils to come out of her bone marrow just as we will cheer for UH to win this weekend! It’s a struggle, but they’ll do it eventually (Maddie’s neutrophils too)! Poor Maddie… she’s going stir crazy having to stay at home for so long. The only places she’s been for the past two weeks is our house, nana’s house and the hospital. Just like old times. Looks like a big part of her Fall break will be more of the same. The good thing is that she still has Trevor so we have to keep him healthy for his sis!